One of the things I love about working for electric cooperatives is the opportunity I get to travel around the state and meet with the employees of your co-op. They are hardworking, dedicated folks who spend every day on the job focused on one thing — keeping the lights on. Whether engineers, billing clerks or accountants, they perform a service we all need, and not unlike the dedicated folks working at the fire station or the police department, they don’t often get a “thank you” for doing it. While I’m typically there to tell them about the things that are happening in Nashville or Washington, D.C., expressing some of my personal gratitude is usually on the agenda. Gratitude is especially deserved for electric linemen. For years you have probably seen their photos in this magazine and maybe even grown accustomed enough to their image to skip right past and enjoy the next feature or article. Perhaps you only think about the work a lineman does when he knocks on your door to say that power will soon be restored. Or, similar to policemen or firemen, we only think of the risk they take just by doing their job on some special day of recognition or, even worse, when a tragedy occurs. That is a shame. I’m thankful for their work every single day. As I sit at my desk and write these words, their work is evident in many things: in the lights in the ceiling that allow me see across the room, in the cool air blowing out of the vents that tempers the 90-plus-degree temperatures outside, in the telephones that I use to talk and text with friends all over the world, in the computer on which this article is being typed, saved, edited and prepared for publication. The list could be much longer because electricity affects nearly everything we do. First and foremost, being an electric lineman is dangerous. Depending on the source, some say it is the third, fifth or eighth most dangerous job in America. We all teach our children not to stick their fingers in the socket, but these brave men and women deal with live electricity and “hot” lines every single day. In addition to working directly with bulk electricity delivery, their workplace can often be 50 feet in the air or in a confined underground space. The unfortunate reality is that someone’s first mistake could very well be the last. Accidents are rare, but the consequences are very serious. That’s one reason why co-ops invest so much time, energy and money in safety training for our linemen. 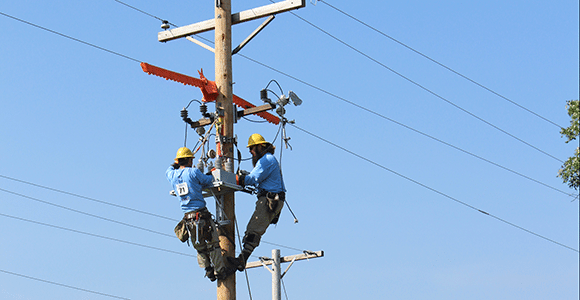 Here in Tennessee, electric cooperatives are proud to join together with our friends from municipally owned utilities to provide rigorous and relevant training to all of our linemen through the Job Training and Safety program. We are thankful that the state of Tennessee recognizes how important this is and incorporates this program in the College of Applied Technology at Murfreesboro. 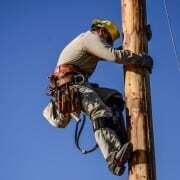 Second, the work a lineman performs is physically difficult. They climb poles, lift heavy equipment, turn wrenches, etc. The old slogan about “neither rain, sleet, snow or storms will ever stop the U.S. Post Office” is just the starting point for a lineman. Think about when you have needed power restored the most; it is probably during a storm or some other type of severe weather. While we seek shelter, the lineman is often out in the elements. Much has been and will continue to be said about the health of our nation because of our diet and lack of exercise. Though I won’t make any of those arguments in this article, human resource experts will tell you that it is becoming more difficult to recruit people who are willing to take on physical labor in their jobs. This is also true in the electric utility industry. Third, becoming a lineman is a long, sometimes grueling process. On-the-job training through apprenticeship programs is required and takes years to complete. Besides requiring a lot of patience and determination to master the skills necessary to be safe on the job, linemen must know, understand and respect the engineering specifics of the electric system on which they are working. For all of these reasons and more, say thanks the next time you see a lineman. Better yet, a thought just came to me. While on layovers at airports, I have occasionally anonymously paid for the meals of men or women in uniform as a way of thanking them for their service to our country. The next time you are buying a coffee at the gas station or eating at the local diner or your favorite lunch stop and you see one of your co-op’s big bucket trucks pull up, tell the waitress that one of the coffees or sandwiches is on you. Grain bins: harvesting safely Energy savings can be hard. Make it easy.